On March 29, 1921 the Japan Advertiser of Tokyo newspaper published a report stating that British philosopher, mathematician and sociologist Bertrand Russell, at the age of 49, had died of pneumonia while teaching at a university in Beijing. There was just one minor problem with this report, however — Russell was still alive. To be clear, in 1921, Russell was unabashedly Team China and Japan knew it. In fact, prior to Russell’s July visit, the Japan Advertiser never did retract their erroneous obituary. Russell and Dora, annoyed yet amused at Japan’s actions, decided to have a bit of fun with it. Their first stop was to Kobe to see The Japan Chronicle editor Robert Young. Along the way, Russell witnessed “a great strike going on in the [Kawasaki] dock-yards [in Kobe],” led by 33-year-old Christian pacifist and hero-to-the-poor Toyohiko Kagawa. The strike gave Russell something to smile about, since the only reason it was being allowed was due to a loophole stating that police “would not tolerate processions except in honour of distinguished foreigners.” Well, here one was, back from the dead, a momentary British zombie with sympathies toward labor unions. Russell was more than happy to discreetly slide into a labor meeting and deliver a short speech to a group of protesters. Kagawa, also an upcoming socialist politician who’d been sent to jail for his support of labor causes, hoped to use Russell’s voice to galvanize even more workers toward fairer rights for factory workers. Russell also wasn’t fond of the overenthusiastic customer service at fancy restaurants. “The waiters treated us as if we were royalty and walked backwards out of the room. We would say, ‘Damn this waiter’, and immediately hear the police typewriter clicking.” To Russell, being treated as exceptional removed him from the commonality of human experience. In reality, he was simply a cantankerous middle-aged man with his two-decades-younger second wife. Sure he’d written and read a few books, but the beauty of living was in the harmonic state of cause-sharing and togetherness. Another aspect Russell disliked was the non-chivalrous way Japanese men treated women. In his autobiography, he called their attitude “somewhat primitive,” then recounted a moment riding a crowded “suburban train” with Dora and Eileen Power, an economic historian. Russell did manage to have a few informal conversation parties with a group of around 30 professors and local intellectuals, once at the Miyako Hotel in Kyoto on July 21 and then on July 26 at the Imperial Hotel in Tokyo, according to scholar Miura Toshihiko. He also had a pleasant meeting with a “young and beautiful” 27-year-old progressive Japanese feminist named Noe Ito. Dora in particular enjoyed speaking to Ito, a woman whose partner was an anarchist named Sakae Osugi. 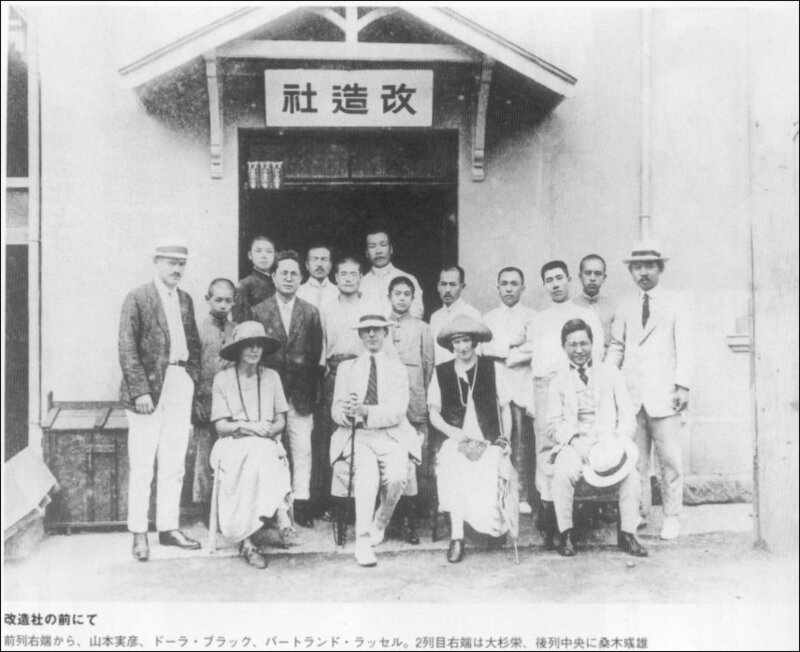 Ito and Osugi were both despised by the government and through articles, essays and demonstrations she often attempted to undermine the kokutai’s (the emperor’s sovereign government) vice-like grip over the majority’s mindset thanks in part to a series of peace preservation laws that infringed upon the right to publicly express disapproval via a labor movement or publishing. According to Russell, while he and Dora were staying with Ito, Dora asked her, “Are you not afraid the authorities will do something to you?” Ito, fluent in English, went ahead and gestured her throat being slowly slashed. “I know they will do that sooner or later,” she responded. In 1921, Russell may have stood as a way for Japan, as scholar Kondo Eizo wrote, “to understand what was going on in the world and [for Japanese intellectuals] to develop a critical viewpoint towards Japan,” but by the time he passed away in 1970 at the age of 97, he had become a grandfatherly symbol of pacifism still rarely seen today. Next month we'll take a glimpse into Audrey Hepburn's three brief visits to Japan and why Japanese people still hold her in such high regard. One of the more interesting things I've read on JT. Interesting ... but a post-hoc prophylactic of history. I suspect Shakespeare could use a bit of that same euphemistic resurrection .... 'Something's rotten in the state of Denmark'. Bertie's was good in his day. But wake me when Chomsky gets a write-up. Fascinating. Different world(s) back then. Wonder what Russell would've made of Japan if he'd visited ten years later, when the militarists were really getting going? Yes fascinating. But also shows that for all of his brilliant insights, Russell was also quite off the mark on a lot of things. And Noe Ito along with her lover Osugi Sakae and his 6-year-old nephew would be beaten to death by the police in a police cell in September 1923, a couple of weeks after the Kanto Earthquake. Very interesting! Please, JT, more articles like this one. I also liked the other articles in this series, especially the ones on Einstein and Marilyn Monroe.